Description: BAT41-1 - first professional monitor of ABP and heart rate for consumptive use which is ntended for single measuring and daily monitoring of ABP and heart rate. This monel is a simplified version of the monitor ВАТ41-2. Description: The Blood pressure and ECG Holter monitor is applied for electrocardiogram (ECG) monitoring by using the Holter methodology through 3 independent bipolar leads and blood pressure (BP) SIMULTANEOUSLY in hospital and at home within 28 hour period of time. Description: SDM3 monitor is applied for electrocardiogram (ECG) monitoring by using the Holter methodology (continuous) record, by one, two or three leads in stationary and ambulatory conditions, up to 48 hours. 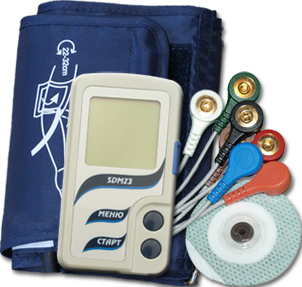 A monitor is fastened with a neutral electrode on the body of patient in the monitoring mode. A monitor connection with a computer or device under the Android OS control for programming is carried out by Bluetooth. For processing, analysing and holding of received data it is used handy software with many functions. Description: Calibrator of ABP and heart rate Puls - is indended for testing of measuring instruments of ABP which operate by oscillometric method. The calibrator allows immitating of the processes which has place in the cuff on the upper arm of a man when measuring ABP.